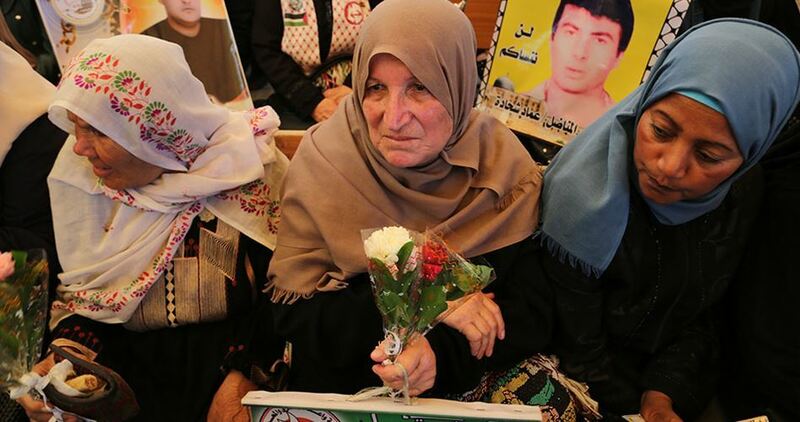 For about 20 years, the sister of prisoner Ammar az-Zain has been suffering humiliation and maltreatment whenever she travels through West Bank crossings and checkpoints in order to visit her brother. Like all the Palestinian women who are exposed to the same treatment, az-Zain complains about the great suffering she goes through when stopping at Israeli crossings on the way to visiting her brother, Ammar, in an Israeli jail in the 1948 occupied lands. In remarks to the Palestinian Information Center (PIC), she said that the Israeli wanton measures at the crossings cause severe overcrowding and make Palestinian families wait for long hours in harsh conditions before they get entry permits or denied entry. She described such measures as “abhorrent and humiliating” practices aimed at punishing the families of prisoners before allowing them to visit their relatives in jails. She pointed to the exposure of women to humiliating and cruel searches at Israeli crossings, especially when they are forced to enter physical scanning rooms. 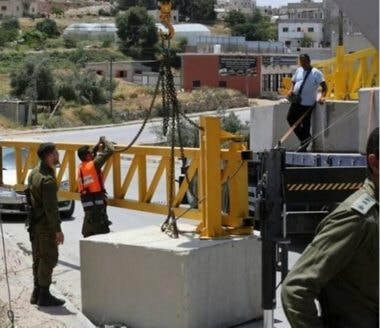 In the same context, Palestinian workers also suffer from ongoing humiliation as they travel to their workplaces, such as factories and restaurants, in Israeli areas through crossings like the Qalqilya crossing. The arbitrary measures at the Qalqilya crossing prolong the travel of Palestinian workers to their workplaces, where they spend 12 hours traveling to their workplaces and staying there before going back to their homes. 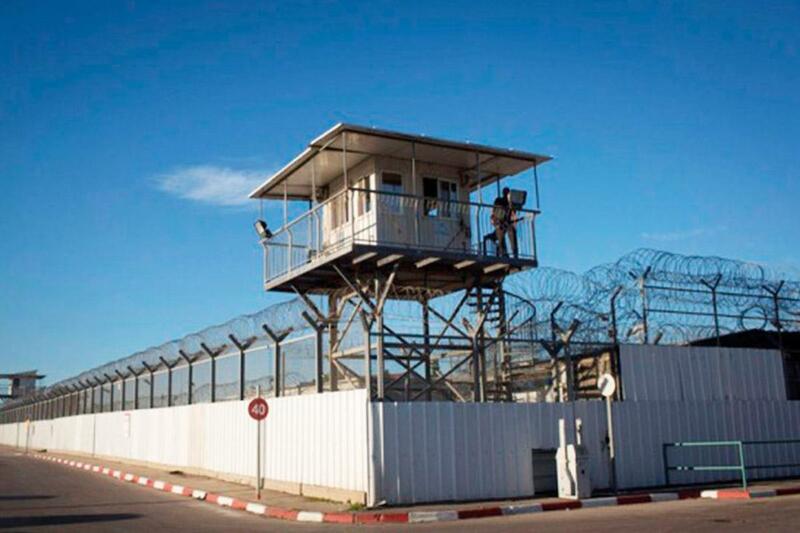 One of those workers told a PIC reporter that Palestinian men and women at the Qalqilya crossing, in particular, face systematic degrading treatment and are forced to take off their clothes for search. “What is there is not suffering but tragedy. Many workers start to stay near the crossing at 11 or 12 o’clock at night so as they could enter earlier. Such situation means that those citizens are not able to see their wives and children,” he said. According to B’Tselem information center, more than 30,000 Palestinians have permits to work in Israel, and may enter it by crossing any one of eleven checkpoints. Three checkpoints are located in the southern West Bank, five in its center, and three in the northern West Bank. 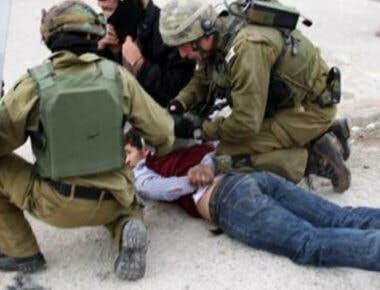 The Palestinian Prisoners’ Society (PPS) has reported that Israeli soldiers abducted, on Monday afternoon, four Palestinians, including a child, from Jenin and Hebron, in the northern and southern parts of the occupied West Bank. The PPS office in Jenin, said the soldiers abducted Nabil Mohammad Abdul-Jabbar, 31, from Sielet ath-Thaher town, and Majed Amjad Jom’a, from the ar-Rama village, after stopping them at a military roadblock, south of Jenin. 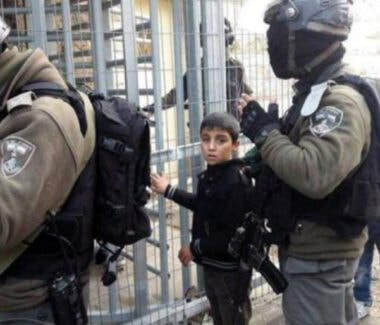 Furthermore, the soldiers summoned a child, identified as Tha’er Younis Rajabi, 14, for interrogation in Etzion military base, north of Hebron, and abducted him shortly after he arrived there. The soldiers also abducted Islam Abdul-Halim Houshiyya, 19, from his home in Yatta town, south of Hebron. The Israeli Occupation Authorities (IOA) released Monday evening two Palestinian girls, from Bethlehem, few hours after their release, rights sources said. The two sisters Assil, 14, and Nisrin Abu Baker, 15, were detained along with 20 others in an Israeli pre-dawn arrest campaign across West Bank. The two girls are the daughters of the administrative detainee Bassem Abu Aker who spent 20 years behind Israeli bars. Head of the legal unit at the Palestine Prisoner’s Society Jawad Boulos said Israel’s Salem military court sentenced hunger striking Palestinian detainee Khader Adnan to one year in jail, a fine of 1,000 shekels, and an 18-month suspended term. The health condition of Palestinian prisoner Khader Adnan has taken a serious turn for the worse, as his open-ended hunger strike has been ongoing for 58 consecutive days to protest his arbitrary detention in Israeli lock-ups. Khader Adnan’s wife has expressed concerns over his exacerbated health status and the preplanned medical neglect pursued by the Israeli prison authorities against her isolated husband, whom she said cannot stand on his feet and moves on a wheelchair. On Sunday, Adnan, who started an open hunger strike in Israeli jails 58 days ago, decided to stop drinking water. Israel's Salem court has postponed Adnan's trial until 29 October, and despite his deteriorating health condition, Adnan is held in solitary confinement and denied family and lawyer visits. A father of seven, Adnan has waged three hunger strikes in Israeli jails since 2012 against administrative detention, with neither charge nor trial. Adnan, from the northern occupied West Bank province of Jenin, was kidnapped by the Israeli forces on December 11, 2017 over allegations of anti-occupation incitement. A number of Palestinian civilians were kidnapped by the Israeli occupation forces (IOF) at daybreak Monday in abduction sweeps rocking the West Bank and Jerusalem. The Israeli military claimed, in a statement, responsibility for the abduction of 26 Palestinians over allegations of involvement in anti-occupation activities. A 15-year-old girl—Nisreen Abu Aker—and her brother, Asil, aged 14, were kidnapped by Israeli soldiers from their family homes in Ayeda refugee camp, north of Bethlehem. Their father has been held in Israeli jails. The occupation forces also kidnapped 17-year-old Abdul Halim Qufeisheh from his family home in al-Khalil city. 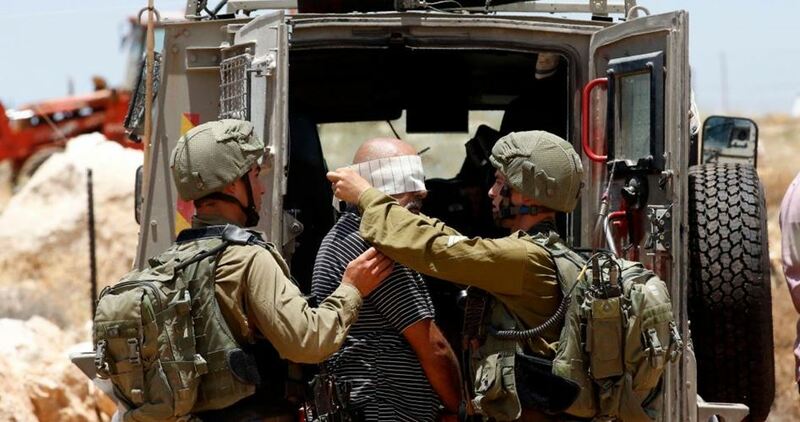 Seven Palestinians were meanwhile kidnapped by the IOF from Ramallah, three from Bethlehem, two from al-Khalil, two others from Qalqilya, and two more youths from Jenin. The sweep culminated in the abduction of four Palestinians from occupied Jerusalem. The Jenin arrestees were identified as Mohamed Abu Tabikh and Diaa Abu Jalda. Overnight, Israeli army patrols set up checkpoints around Jenin’s western and southern entrances and cracked down on Palestinian civilians. At the same time, clashes flared up in Nablus’s eastern corners shortly after the 20 Israeli military jeeps rolled into the area through Beit Furik checkpoint. An Israeli patrol further raided Kafr Kalil town, south of Nablus, sparking terror in the area. Israeli soldiers abducted, on Monday at dawn at least twenty-two Palestinians, including two sisters, ages 14 and 15, from their homes in several parts of the occupied West Bank, the Palestinian Prisoners’ Society (PPS) has reported. The soldiers invaded many governorates in the occupied West Bank, including East Jerusalem, searched and ransacked dozens of homes, and interrogated many Palestinians while inspecting their ID cards. In addition the soldiers summoned for interrogation in Etzion military base and security center, south of Bethlehem, two Palestinians, identified as Majdi Samer al-Badan, 13, and Habis al-‘Amour, 22, and abducted two siblings, identified as Aseel Bassem Abu Aker, 14, and her sister Nisreen, 15, from Aida refugee camp, north of the city. It is worth mentioning that the father of the two teenage girls is a political prisoner, held by Israel. The army also installed many roadblocks across the occupied West Bank, stopped and searched dozens of cars, and interrogated many Palestinians while inspecting their ID cards. Aseel Bassam Abu Aker, 14, Aida refugee camp – Bethlehem. Nisreen Bassam Abu Aker, 15, Aida refugee camp – Bethlehem. Luay Habis al-‘Amour, 19, Teqoua – Bethlehem. Yahia Ibrahim Sha’er, 22, Teqoua’ – Bethlehem. Mohammad Abu Tabeekh, Wad Burqin – Jenin. Dia’ Yousef Abu Jilda, Jenin refugee camp – Jenin. Morad Haj Ibrahim, Jenin refugee camp – Jenin. Nasser Mofeed, Deir Abu Mashal – Ramallah. Tareq Harb, Deir Abu Mashal – Ramallah. Abdullah Hamdan, Deir Abu Mashal – Ramallah. Saleh al-Maaken, Deir Abu Mashal – Ramallah. Amir Abdul-Kheir, Deir Abu Mashal – Ramallah. Abdul-Latif Abdul-Salam Rimawi, Beit Rima – Ramallah. Hamada Mo’in Rimawi, Beit Rima – Ramallah. Mohammad Zakariya Sheeha, Anata – Jerusalem. Bassel Zayed, Qalandia – Jerusalem. Shadi al-Qawasmi, Anata – Jerusalem. Mahmoud al-Qawasmi, Anata – Jerusalem. Abdul-Halim Ibrahim Qfeisha, 19, Hebron. Ibrahim Ibrahim Qfeisha, 21, Hebron. Israeli soldiers abducted, on Monday at dawn, two underage siblings and a young man, in addition to summoning a child for interrogation, in the West Bank governorate of Bethlehem. Several army jeeps abducted Aseel Bassam Abu Aker, 15, and her sister Nisreen, 16, from their home in ‘Aida refugee camp, after violently searching it. It is worth mentioning that the father of the two girls is a political prisoner, held by Israel. In addition, the soldiers invaded Teqoua’ town, east of Bethlehem, abducted a young man, identified as Luay Habis al-‘Amour, 22, and summoned Majdi Salem al-Badan, 13, for interrogation, after searching their homes. Recently, in another shocking incident, Israel’s Culture Minister Miri Regev was outraged by a Palestinian children’s novel written by Walid Dagga, a Palestinian prisoner who spent more than thirty years in jail for resisting the occupation. In her opinion, he is in jail not to write novels but to be punished. This might cause shock to some, but this falls perfectly in line with how Israel’s official discourse stereotypes Palestinians: as mere demons who are able only to kill indiscriminately. Writing novels? Well, this does not fit in this stereotype. Israel’s Minister of Interior, Aryeh Deri, prevented a launching ceremony for the novel being held in the writer’s home village. The Israel Prison Service declared that it will conduct a full investigation into the incident and punish the writer, who has already spent 34 years in prison. Ironically, a few months ago Walid was punished by Israeli authorities by adding two more years to his sentence because he “conspired” with a Palestinian member of the Israeli parliament, Basel Ghattas, to smuggle mobile phones into prison. The news told us “an Israeli court convicted Ghattas on charges of fraud, breach of trust and smuggling a prohibited letter and electronic equipment into a prison. He was sentenced to two years in jail. An earlier charge of providing material support for the perpetration of an act of terror was removed as part of the deal and Ghattas was also forced to resign from his post”. Why did Ghattas do it? He gave a simple answer in an article published by Middle East Eye: “It was a personal act, motivated only by humanitarian and moral reasons, for which I’m ready to take full responsibility […] One of the most severe atrocities that Palestinian prisoners endure is the denial of their right to communicate with their families and relatives by phone and the limitations that Israeli authorities put on the visitors they can receive”. He added: “Prisoners have only been allowed to see first-degree relatives every two weeks, although thanks to a new International Red Cross policy, that will be reduced to once a month”. A few weeks ago, I wrote about how Israel’s military intentionally targets Palestinian media workers covering the demonstrations on the Gaza fence, many of whom were killed by direct sniper shots hundreds of meters away from the fence. I also wrote, in another article, about how Israel’s court tried Palestinian poet Dareen Tatour and sentenced her to two years in prison for writing a poem reflecting her sympathy for the tragedy of her fellow Palestinians. I also mentioned Lama Khater, a Palestinian journalist, writer and a mother of 5 children, who was arrested at her home in the middle of the night and accused of building an armed terrorist organisation. These are not isolated incidents, but rather represent a mind-set and systematic practice based on pre-prepared plans. This might explain why most renowned Palestinian poets spent part of their lives behind Israeli bars, had to go into self-exile or were assassinated. Israel never hated anyone more than Palestinian intellectuals and artists, because they are living proof that its narrative is completely fictional. Even those Palestinian writers and artists who lived outside their homeland were targeted by Israel’s secret service – Mossad – and killed. Palestinian collective memory retains many stories in this regard, such as that of Ghassan Kanafani, Abdel Wael Zwaiter, Kamal Nasser, Majed Abu Sharar and many others. Even when Palestinians are able to overcome Israeli restrictions and resentment to succeed, Israel wants to share their success. Israel insists on calling them Arab-Israelis, implying that it cherishes diversity and encourages “its Arab citizens” to unleash their potential. The Joubran Brothers, better known as Le Trio Joubran – an oud trio playing traditional Palestinian music – use every occasion to stress their Palestinian-ness, dedicating their work to a free Palestine and to their people who suffer under occupation. Yet, in the Israeli media they are referred to as Arab-Israelis and the same applies to Mahmoud Darwish, Samih Al-Qasim and many others. The “Jewish Nation State Law” recently endorsed by the Israeli parliament leaves no doubt about the nature of this so-called state. Only followers of one religion – Judaism – are eligible to full citizenship and national rights, including the right of self-determination. Why? Because this is a Jewish State. The rest are only temporary residents according to Dore Gold, Israel’s former Director General of the Ministry of Foreign Affairs and a key ally and close adviser to Israeli Prime Minister Benjamin Netanyahu. When he was asked in an interview with Mehdi Hasan if Palestinian citizens also have a right to self-determination under the Nation State Law or only Jewish citizens, Gold answered: “Nope. Canadian immigrants in America don’t and nor do Mexican immigrants”. This is a hatred mixed with envy because, deep in their hearts, Zionists know that even if they live for two thousand years or more on this land, they will never be able to love it and sacrifice for it as Palestinians do. They will never be able to get drunk on the smell of the soil, befriend little birds, memorise the face of each and every herb, shrub and bush on the hills, give names to the slightest blow of air and absorb the rays of the Palestinian sun on their skin. This land is not a production unit that you monitor from your air-conditioned villas with drone cameras. It is a story of thousands of years of love between two living beings – only the children of the soil understand. - Dr Mohammad Makram Balawi is a Palestinian writer and academic based in Istanbul. He is the president of Asia Middle East Forum. His article appeared in MEMO. Khader Adnan, who started an open hunger strike in Israeli jails 57 days ago, on Sunday decided to stop drinking water. Israel's Salem court has postponed Adnan's trial until 29 October, and despite his bad health condition, Adnan is held in solitary confinement and denied family and lawyer visits. A father of seven, Adnan has waged three hunger strikes in Israeli jails since 2012 against administrative detention. Palestinian prisoner Khader Adnan has continued, for the 57th day, his open-ender hunger strike in protest at his arbitrary detention. According to Muhjat al-Quds Foundation, prisoner Adnan is still deprived of seeing his lawyer or any member of his family. The foundation called on human rights groups and the Red Cross to urgently intervene to pressure the Israeli side to allow prisoner Adnan to meet his lawyer. 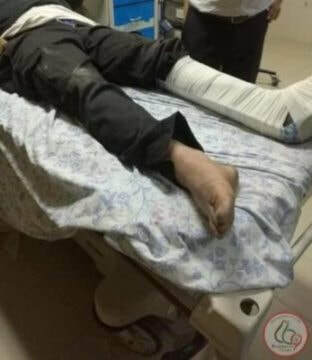 The family of Palestinian prisoner Ahmed Mousa, from al-Khader town in Bethlehem, has expressed concern over his health condition, affirming that he has been exposed to harsh interrogation conditions in Petah Tikva detention center for about a month. The family, who has been banned from seeing Mousa since his arrest, appealed to human rights groups to intervene and pressure the IOA to allow them to visit their son. One month ago, Israeli troops stormed and ransacked the house of Mousa at dawn and then rounded him up, with no known reason. A number of Palestinian civilians were kidnapped by the Israeli occupation forces at daybreak Sunday in abduction sweeps rocking the West Bank. The Israeli military claimed in a statement responsibility for the abduction of seven Palestinians over allegations of involvement in anti-occupation activities. The Israeli army alleged that a home-made grenade was hurled at military troops stationed in Azzoun town, east of Qalqilya. No injuries were reported. The sweep targeted three Palestinians from Bethlehem, one Palestinian from Tulkarem, and another from al-Jalazoun camp, north of Ramallah. Scores of Palestinian citizens suffered from their exposure to tear gas on Saturday evening when the Israeli occupation forces (IOF) attacked them in Azzun town, east of Qalqilya city, north of the occupied West Bank. Local sources told the Palestinian Information Center (PIC) that violent clashes broke out between local young men and Israeli soldiers at the main entrance to Azzun town after the latter closed the road barrier and obstructed traffic. According to the sources, the young men threw Molotov cocktails at Israeli military patrols, which stormed the town, randomly fired volleys of tear gas grenades at the youths and passersby, and maltreated citizens. 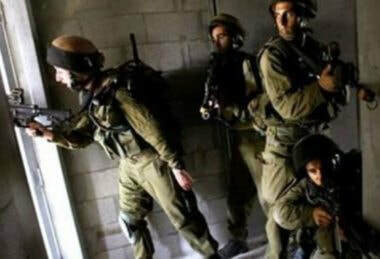 Israeli soldiers abducted, on Sunday at dawn, three young Palestinian men from several areas in Bethlehem Governorate, in the occupied West Bank. 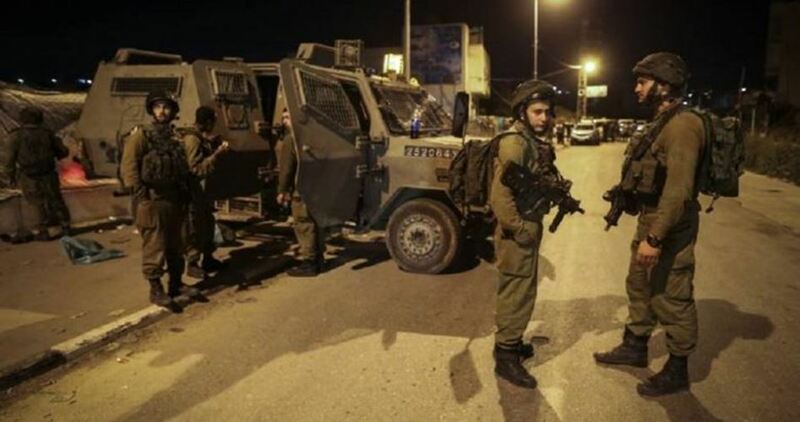 The Bethlehem office of the Palestinian Prisoners Society (PPS) said the soldiers invaded and searched several homes in Teqoua’ town, southeast of Bethlehem, and abducted Ahmad Jamal al-‘Amour, 20, and Ahmad Khaled al-‘Amour, 21. 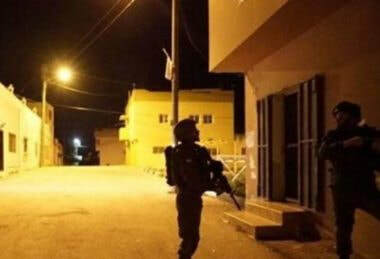 It added that the soldiers also searched homes in Husan town, west of Bethlehem, and abducted Mohammad Saleh Za’oul, 26. 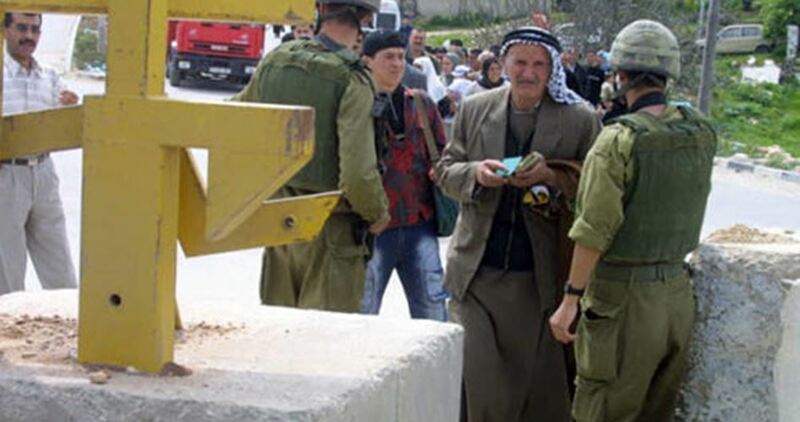 The soldiers also installed roadblocks in several parts of the governorate, before stopping and searching many cars, and interrogated a few Palestinians while inspecting their ID cards. An Israeli army jeep rammed, Saturday, two Palestinians in Azzoun town, east of the northern West Bank city of Qalqilia, while the soldiers fired dozens of gas bombs, causing many Palestinians to suffer the effects of teargas inhalation. Medical sources have reported that two Palestinians, identified as Omar Abdul-Halim Hussein, 45, and Ahmad Sa’id Salim, 25, suffered various fractures, cuts and bruises after the soldiers deliberately rammed them with their armored jeep, during protests in the town. They added that local medics provided the two Palestinians with urgently needed first aid, and rushed them to Darwish Nazzal hospital in Qalqilia; their wounds were described as moderate. The soldier also fired a barrage of gas bombs and concussion grenades, causing dozens of Palestinians to suffer the effects of teargas inhalation. Furthermore, the soldiers abducted one Palestinian, after beating him up, and took him to an unknown destination. The Israeli occupation forces (IOF) on Saturday afternoon stormed the Old City of al-Khalil, south of the West Bank and kidnapped a Palestinian ex-detainee from his workplace. According to a reporter for the Palestinian Information Center (PIC), border soldiers aboard military vehicles stormed Tariq Ibn Ziyad area in the Old City and raided a store selling foodstuffs and detained for a while all the customers who were inside. The soldiers also ransacked the store and checked the IDs of all citizens who were in there before they rounded up the storeowner, Hasan al-Rajbi, who was a prisoner in Israeli jails. Detainee Khader Adnan's hunger strike in Israeli jails on Saturday entered day 56, according to the Palestinian Prisoner Society. Adnan, who is suffering from serious health problems and can only move using a wheelchair, has recently started to show serious symptoms such as vomiting blood. Adnan's wife in press statements expressed her concern over her husband's deteriorating health with all the isolation and medical neglect he is subjected to. Mohjat al-Quds Foundation said that Adnan started an open hunger strike 56 days ago in protest at his arbitrary detention. Mohjat al-Quds added that Adnan's family have no accurate information about his health since he is banned from seeing his family and lawyer based on an Israel Prison Service order. It called on concerned human rights organizations and the International Committee of the Red Cross to immediately intervene and pressure Israel to stop its aggressive policies against Palestinian prisoners. Adnan, who is a resident of Arraba town in Jenin, was arrested in December 2017 on charges of "incitement". He is known for two long successful hunger strikes he had waged in Israeli jails against administrative detention. 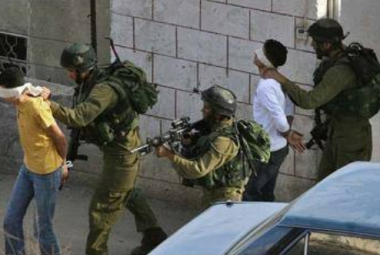 Israeli soldiers abducted, Friday, two Palestinians, including a child, in Qalqilia, in northern West Bank, and in Hebron, in the southern part. Media sources in Qalqilia said the soldiers abducted Ahmad Raslan Qawwas, 18, in the northern part of Qalqilia city, after the army invaded it, and took him to an unknown destination. The soldiers also abducted a child, identified as Ayman Ammar Abu Aisha, 14, in the Bab az-Zawiya area, in the center of Hebron city. The army claimed several youngsters hurled stones at the soldiers, stationed at the permanent military roadblock, installed at the entrance of the Shuhada Street, and chased the Palestinians, before detaining the child. In related news, a group of illegal colonialist settlers installed tents in the Ibrahimi Square, next to the Ibrahimi Mosque in Hebron’s Old City, and surrounded it with iron bars and barbed-wire fences, in preparation for establishing a new outpost. The health condition of Palestinian prisoner Khader Adnan has taken a serious turn for the worse, as his open-ended hunger strike has been ongoing for 55 consecutive days to protest his arbitrary detention in Israeli lock-ups. 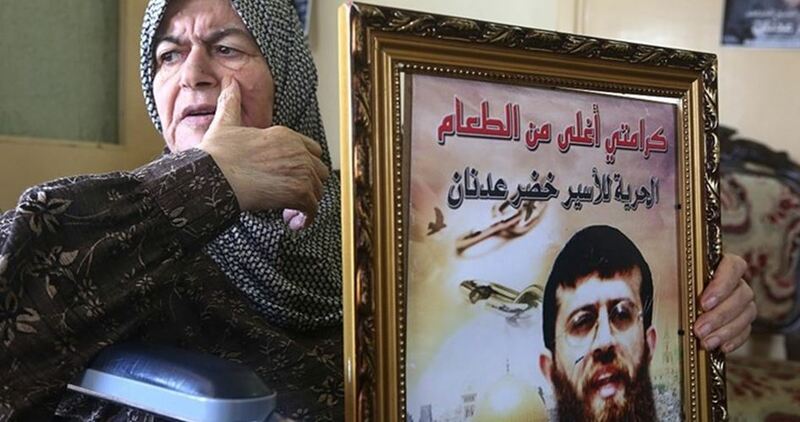 Khader Adnan’s wife has expressed concerns over his exacerbated health status and the preplanned medical neglect pursued by the Israeli prison authorities against her isolated husband. She added that Adnan cannot stand on his feet, moves on a wheelchair, and started vomiting blood. Recently, Muhjat al-Quds Foundation said prisoner Khader Adnan declared his open-ended hunger strike 55 days ago in response to being held arbitrarily in Israeli dungeons. 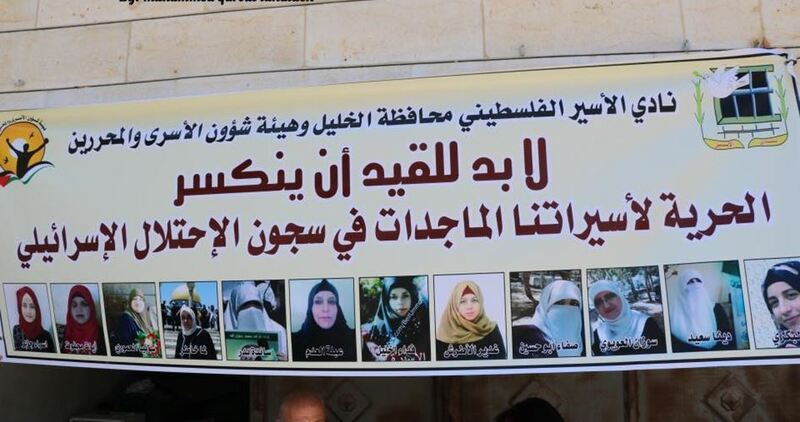 The foundation has railed against Israel’s torture tactics, including bans of visits by family members and attorneys, perpetrated against the hunger striker, in contravention of international laws and treaties. In a letter leaked from the prison and published a couple of weeks ago by Muhjat al-Quds Foundation, Adnan said that he had been locked up in a very small and isolated cell in Jalama jail for long weeks, during which he had been barred from visits by his lawyers and family and made to endure dire conditions of captivity. Head of the legal unit at the Palestinian Prisoner’s Society, Jawad Boulos, said following a visit to Adnan in the Ramla lock-up that the hunger striker continues to refuse to take in vitamins and undergo medical check-ups. 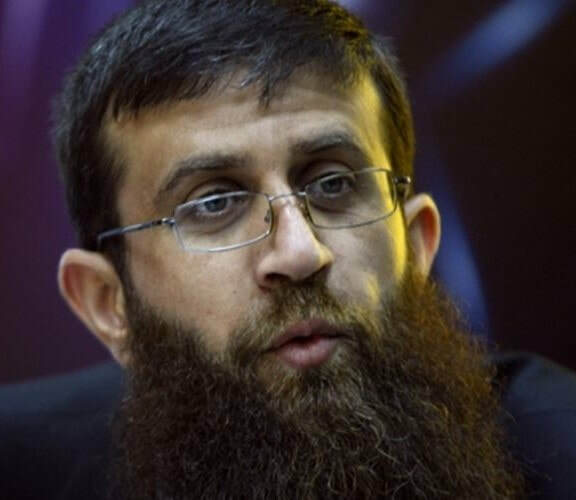 Khader Adnan, from the northern occupied West Bank province of Jenin, was kidnapped by the Israeli forces on December 11, 2017 over allegations of anti-occupation incitement. The Israeli occupation forces at daybreak Friday rolled into Tulkarem province, in the northern West Bank, and ransacked Palestinian facilities, sparking terror among civilians. 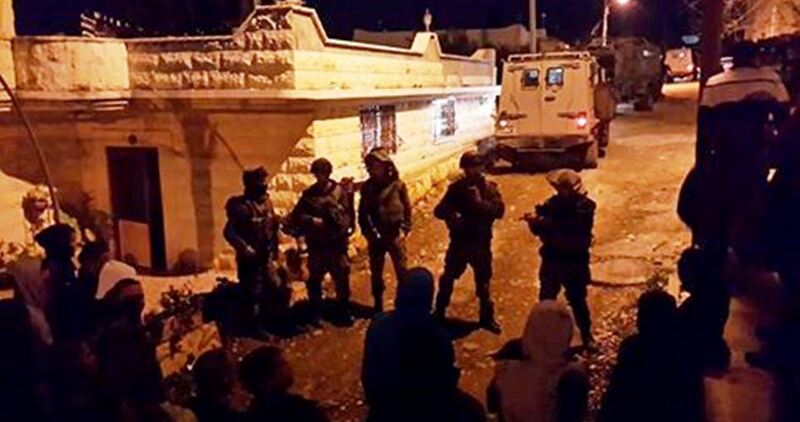 Israeli soldiers broke into Shweika area in Tulkarem and raked through residential neighborhoods, before they stormed the family home of the wanted the anti-occupation attacker Ashraf Na’aluwa and subjected the inhabitants to intensive questioning. Israeli soldiers ravaged civilian homes in the area and cracked down on the locals. The occupation forces further raided the office of the Shweika Charity and other surrounding structures, cordoning off the entire neighborhood in the hunt for Na’luwa.